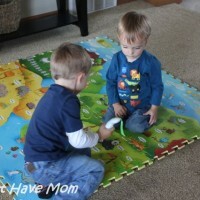 HABA Moover Baby Truck Review AND Moover Toy Giveaway! 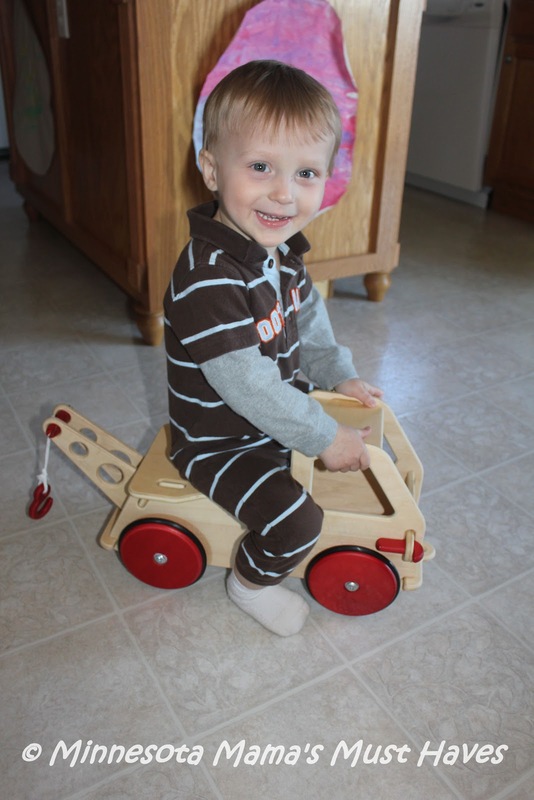 Aiden loves anything with wheels. He is all about tractors, cars, trucks, 4 wheelers, you name it, if it has wheels he is in. 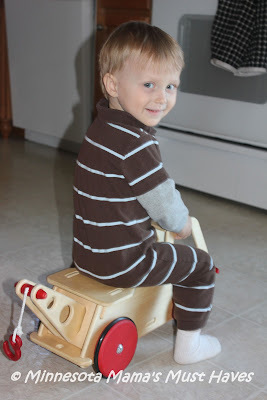 At 2 years old he is constantly on the go and always trying to ride on anything with wheels even if it is only as big as his foot. When I saw that my favorite toy company, HABA, is now the exclusive distributor of Danish Moover Toys I knew that Aiden would be all over this Moover Baby Truck. I mean come on, a tow truck he can ride on?! He LOVES it! 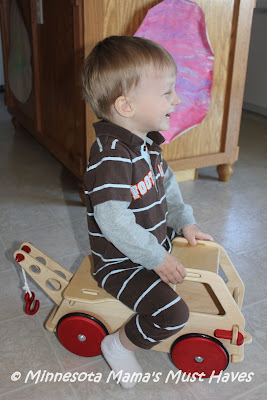 You can actually see the look of glee all over his face as he cruises around on the Moover baby truck. There is even room inside to pack in his stuffed friends, cars, blankie and whatever else he fancies to stuff in there. He likes to take everything along for a ride! Shock absorbing rubber wheels ensure safe play and encourages toddlers to develop their motor skills confidently and at their own pace. This truck is designed for kids ages 1 to 5 so both Danika and Aiden have had fun zooming around the kitchen on this truck. It is sturdy and holds them without any issues at all. Of course they also like to hook up their toys to the tow truck and tow them around too. 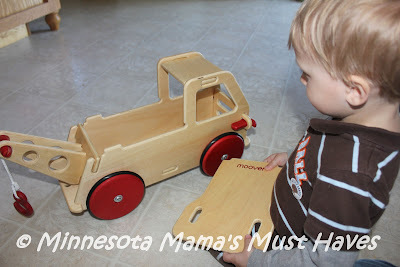 The Moover Baby Truck arrives in a flat package and we had it assembled in minutes. There are no tools required to assemble it. As if it wasn’t already cool enough that it is a tow truck you can ride on, pack your toys into and tow things behind, it also comes apart so your little mechanic can practice taking things apart and putting them back together. How cool is that?! Let your kids learn critical development skills while having a blast doing it! Buy It! 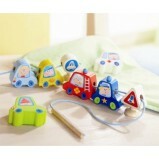 You can buy this totally cool Moover Baby Truck at Maukilo.com. It sells for $85.49 and is made to last. This is one toy that will be kept and handed down to generations to come! 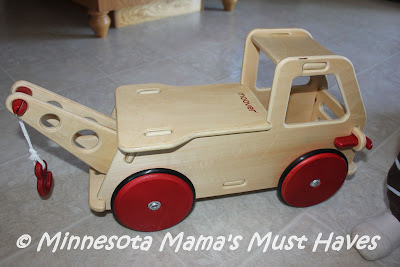 I know that my grandbabies will someday play on this truck too 🙂 It is available in natural and red. 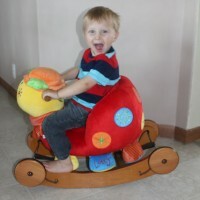 Want to win one of these totally awesome Moover toys? Enter my Rafflecopter giveaway below to win! 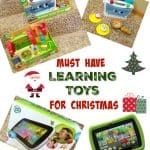 Must Have Educational Holiday Gifts From LeapFrog! « DIY Minnie Mouse Birthday Party Games! Pin The Bow on Minnie Mouse! I would choose the red dump truck! My son would love it! So hard to choose and I keep changing my mind!! I like the Moover Dump Truck Red. love their moover doll pram in red-so cute! I like the Moover Baby Truck in Red. I like their Moover Dump Truck in Natural! I like the doll pram in natural! I would choose the Moover Dump Truck Red. How cool! I would choose the Dump Truck in Natural. Love the Doll Pram in Red, my baby girl would love to push her baby around in it. Mover Baby Truck in Red! I would love the Moover Doll Pram but they are all great! my daughter would love the dump truck in red! I would choose the natural rocking horse. I'd like the Baby Walker in Red. love the Moover Doll Pram Red. I'd choose the Red Moover Baby Truck. I'd choose the Moover Dump Truck- Natural. I would choose the Moover Doll Pram Natural! I would choose the natural colored pram for my baby girl. i love the Moover Rocking Horse Red!!! I would probably choose the mover rocking horse in red! I'd choose the Moover Rocking Horse Red. The doll one is cute, but I love the fire truck! I'd get the Dump Truck in natural. I like the moover dump truck in red. I would choose the Rocking Horse Red! I would love the one you got! I think I would pick the Moover Baby Truck…but do also love the dump truck! All are so cute! The dump truck in natural! 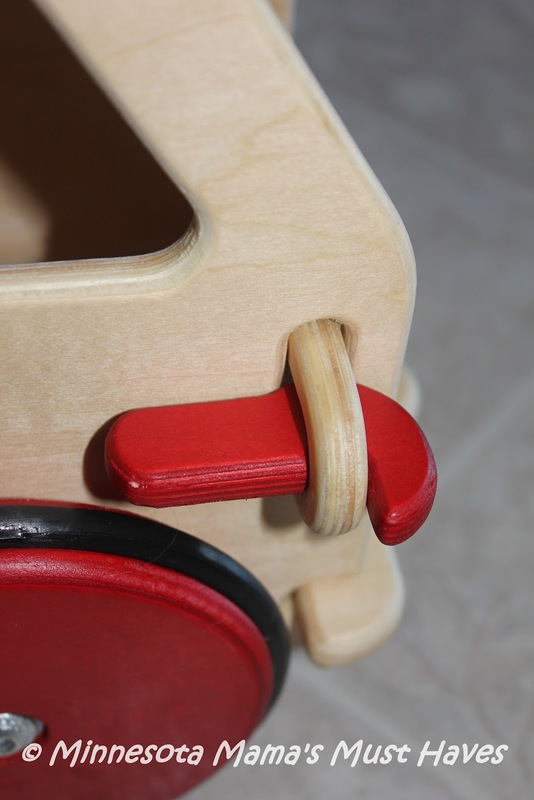 I love the Moover Rocking Horse in Red! I would get the Moover Rocking Horse Natural, my little girl would love that! 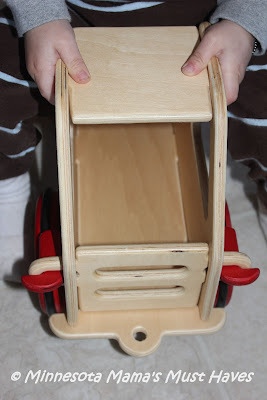 I would pick the Moover Doll Pram Red. I would choose the Doll Pram in red. On form as Tonya E.
I'd choose the Moover Baby Truck Natural. I like the Moover Rocking Horse Red. I would pick the Rocking Horse. 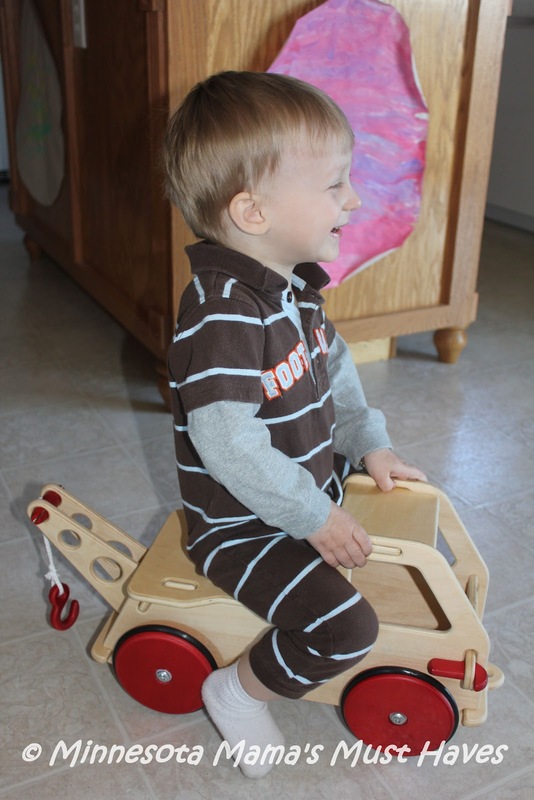 I would choose the Moover Rocking Horse Natural! Moover Rocking Horse in Natural is what I'd choose! I like the Moover Baby Truck Red. I like the truck in red. I like the Moover Baby Walker Natural in red. I forgot to add the style & color: dump truck in red. So nice! I'd love the sweet Moover Doll Pram Natural for my daughter!